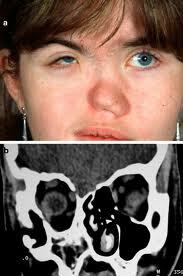 Most people do not know what Hemifacial Microsomia/ Goldenhar syndrome is because it is very rare. Goldenhar Syndrome is a congenital birth defect which involves deformities of the face; it usually affects one side of the face only. This syndrome is a condition in which the lower half of one side of the face does not grow normally. The most obvious sign of this condition is a partially formed ear or total absence of an ear. In goldenhar syndrome benign growths of the eye (epibulbar dermoids) are present sometimes they are even born without an eye. Children with Goldenhar syndrome may also have neck problems, which are most commonly caused by a fusion or bony bridges between the bones of the neck. The chin may be closer to the affected ear and one corner of the mouth may be higher than the other. People who have babies born with this syndrome usually wonder why their baby was born like this. It isn’t their fault that their child was born with this syndrome. Doctors are uncertain why Goldenhar occurs. However, they do not believe it is the result of anything the mother did while she was pregnant. Environmental factors may play a part and there does seem to be an increased incidence of Goldenhar among the children of Gulf War Veterans. There are also different degrees to this syndrome. Some cases are more severe than others. This syndrome is very rare that your chances of having another child with goldenhar are about 1% or less. Your child has about a 3% chance of passing it on to his or her own children. If you have a child that is born with this syndrome than you shouldn’t be afraid of having another child with it because the percentage is so low. The person with goldenhar syndrome might be a little bit more cautious about having children but the percentage of their children having the syndrome is still pretty low. You should also be aware that your child will most likely be born with other problems besides just the physical characteristic ones. In addition to the physical characteristics common to Goldenhar, your child may have: hearing problems, weakness in moving the side of the face that is smaller, dental problems because the soft palate may move to the unaffected side of the face, the tongue may be smaller on the affected side of the face and your child may have fusion of the bones of the neck. Depending on the severity of these problems, your child may need to have some or all of the following surgeries: lowering of the jaw on the affected side, lengthening of the lower jaw, three to four operations to rebuild the outer ear, addition of bone to build up the cheeks, or they might need soft tissue added to the face. I know a little about these surgeries because my baby sister has had some of them, she was born with hemifacial microsomia and goldenhar syndrome. 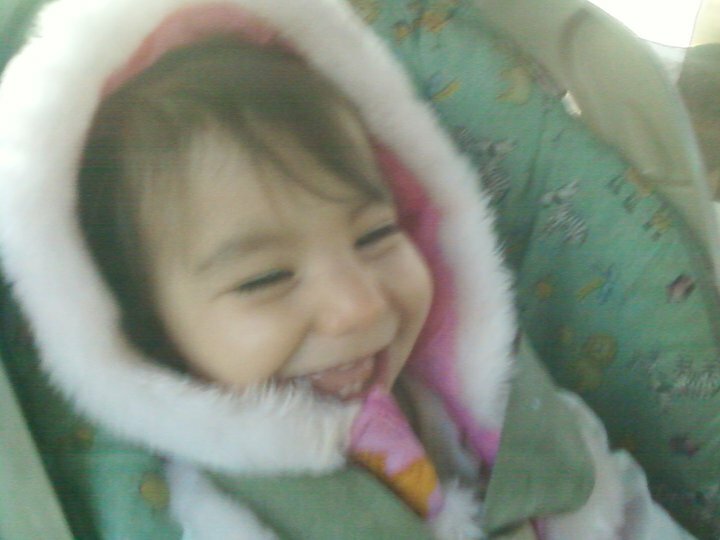 My sister was born on 8/20/09 her name is Nina and the doctors thought she just a couple skin tags on her face. Later we found out they were not just skin tags, it was much more complicated than that. What she had on her face were called accessory tragi and she would be needing surgery to remove them. She had her surgery before she even turned one year old which was a little bit of a risk so we worried the whole time she was in the operating room. Nina’s scars are healing up very well but they are noticeable. Her face does have some difference in size when comparing the two sides of her face. The right side of her face is a little bit smaller than the left side but it is not as bad as some babies have it. She is doing a lot better now but is still having to go to San Francisco for doctor appointments and will to be evaluated for her upcoming surgeries that she will be needing. Nina has also been getting tested for other issues because she started having seizures not too long ago. She will be getting medicine so that she hopefully won’t have them anymore because it is sort of a scary thing to see a baby having convulsions. The doctors are going to help her to continue getting better and progressing through all of these problems. Hemifacial microsomia/ goldenhar syndrome is a pretty intense syndrome to have to deal with. It is a congenital birth defect which involves deformities of the face. Your child will have physical characteristic deformities as well as other health problems. Babies born with this syndrome will need multiple surgeries throughout their child hood. This syndrome should be more known by people so people that have children born with it can have an easier time learning about it. Choice of Topic: Very interesting. I like how the essay was about her personal experience. Since her baby sister had this syndrome. Well-Written (Original) Essay: essay was very well written. Great information. were a little scary, but I liked how it showed what the syndrome did. Formatting (Text & Pictures): I like how the pictures were in the essay. Working Links: All the links worked correctly. Good job! Visually Appealing: The essay looked very neat and organized. Good Labels (i.e. “baby, babies, SIDS, causes, facts, medical”): Had very little labels, but all were relevant. Recommendations for making the essay better (spelling, grammar, pictures, facts, etc. ): I thought the essay was very well written and did not need that much more information. How did the essay change your views about the topic? I thought the topic was very informing. I am glad that I had read it through. Choice of Topic: I love the fact that she could relate to this subject. Well-Written (Original) Essay: Very well written and she added her own personal experience. Appropriate / Relevant Pictures: I like how she was able to show her sister as an example. Working Links: They all worked and were good sources of information. Visually Appealing: Organized well and good use of pictures. Recommendations for making the essay better (spelling, grammar, pictures, facts, etc. ): I don't think you needed more information, and I did not find any errors. How did the essay change your views about the topic? I never knew about this syndrome and it was I received a lot of information from this essay. It was very informing. Well-Written (Original) Essay:Well written essay/ very informative. Formatting (Text & Pictures): Well formatted. Working Links:Yes they are working links that take you to related sites. Good Labels (i.e. “baby, babies, SIDS, causes, facts, medical”):Yes. Recommendations for making the essay better (spelling, grammar, pictures, facts, etc. ):I don't really have any recommendations to give since this essay was pretty solid in my opinion. How did the essay change your views about the topic:It changed my views a lot since i did not know anything about this condition before reading this essay. • Choice of Topic: Pretty good. • Well-Written (Original) Essay: Yupp. • Appropriate / Relevant Pictures: Yeah.. Really good pictures; relating to the topic. • Formatting (Text & Pictures): Very good. • Visually Appealing: Yeahh.. it looks niice. • Good Labels (i.e. “baby, babies, SIDS, causes, facts, medical”): Si Si. • Recommendations for making the essay better (spelling, grammar, pictures, facts, etc. ): None.. It was pretty pimpin. • How did the essay change your views about the topic? Kinda sad.. not gonna lie.